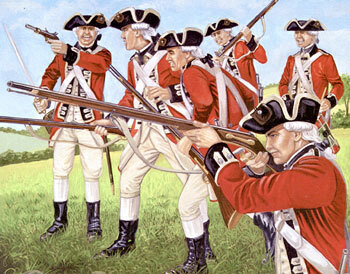 The British are coming! The English is coming! Are you with? | Rottendanish.com – it's about linguistics, disambiguation and quirky language differences, mostly between English and Danish, -which were once the same language. 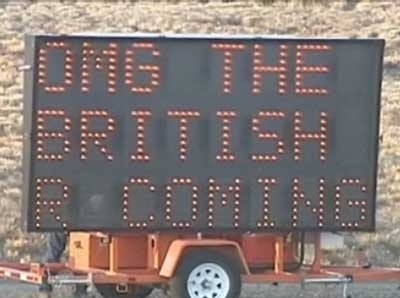 The British are coming! The English is coming! Are you with? 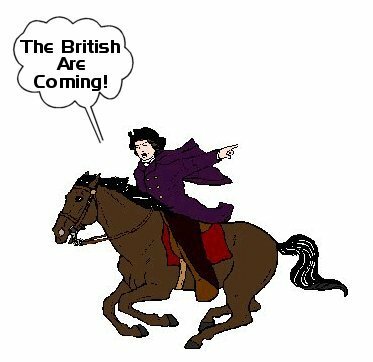 The “English is coming!” is my word-play on Paul Revere’s (or Longfellow’s) famous line. The English language and English words are of course sneaking their way into contemporary Danish vocabulary, both openly and silently. It’s no wonder in a country like Denmark, where upwards of 80% of Danes do, or think they do :-), speak fluent English. So, the English is coming inside Danish. Are you with? “Are you with”: In Danish we often use the expression “Er du med?”, which correctly translated means “Do you follow me?”. Incorrect, verbatim translation is, however, “Are you with”. Yes, it is OK in Danish to end a sentence with a preposition. The trap, which many a Danish English-speaker has fallen into, is of course that the preposition rules are different in English and also that some times English has different words, when Danish has just one. In this case translating “med” with “along” rather than “with” would yield maybe not a 100% correct English, but at least something much closer to it. Are you along? “At bruge penge” means “to spend money” (in a serious way). “At spendere penge”, however, has more of a wasteful connotation, closer to “to blow the money”. Why? Here I have a theory: I think it’s because “at spendere” ends up sounding very close to the Danish verb “at spilde”, which means “to waste”. We store things in our brain by similarities, so that’s probably what colors the meaning of “at spendere” in Danish. And of course one has to be careful with word-combinations and abstractization. Take the previously mentioned “Spending Power”: the direct translation “Spenderingskraft” would still be meaningless in Danish. “Købekraft” is still correct. This entry was posted in History of English, No equivalent, Rotten Danish by Andre. Bookmark the permalink. Interesting blog you’ve got here. Haven’t seen it all yet, but planning to. I did, however, start to wonder a bit, when you wrote “if we Danes know it exists in English and it covers an exact, useful concept, we want it too”. Like most languages of German ancestory, both Danish and English have adapted the word spend/spendere from Latin “expendere”. A quick reference to an earlier Danish use is the Christmas song “Højt fra træets grønne top” from 1848. And it’s probably much older than that. I hope you will be a bit more keen on the etymology before assuming Danish has lent something from English. BTW, I think you put a * too many in f*ck. However, the meaning of ‘spendere’ in this song is probably slightly different from what you were looking for? Thanks. In a way, I think it’s excellent evidence: I think words, like hit songs, can peak and dive in popularity. What we seem to have here is evidence that while the word “spendere” may have been available in Danish in the 30s, it was used differently. I can subjectively say that it wasn’t used much in Danish during my upbringing in 70-80s. So its place in Retskrivningsordbogen today may be due to actual historic presence of it as a Danish word. It’s an old (obsoleted?) Danish word, rather than new English influence. So, I was wrong in saying that it was a new entry into Retskrivningsordbogen, but I was still correct in saying that we still don’t have a direct translation of “spending”, as “spendere” isn’t it (in modern Danish).